Almost PhD: You're a vegan? What do you eat? I’m thinking of starting a new segment on the blog called “You’re a vegan? What do you eat? !” This is for a couple of reasons. First, I get this question frequently, and hopefully such posts will provide an answer to any who are concerned. Second, many of the things that I eat are so lovely that I take pictures of them. We’ll start off this segment with a dessert I made recently (I think it was great-aunt Julia who always said you should eat dessert first). 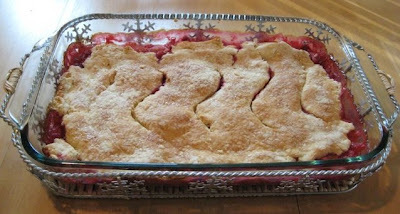 Its called Gingered Cranberry Pear Cobbler. It actually ended up being a ton of work, and the ingredients were kind of expensive. It takes 8 pears. Eight! And have you priced pears lately? They aren’t cheap. The cranberries were on sale though, so maybe that helped a little. The original recipe calls for sour cream, which I substituted with Tofutti Vegan Better Than Sour Cream. Making this dessert was pretty labor-intensive. It took me a long time to peel and slice all those pears, and then making the crust turned out to be a little bit more work than I’d hoped for. When I started out making the dessert, I hadn’t realized there would be kneading, rising, and rolling involved. It wasn’t too bad though, it just dirtied a lot of dishes. The final product was gorgeous, especially when I put it into the beautiful baking dish that my mother-in-law gave me last year for Christmas. The verdict on this dessert: the filling was definitely tart alright. The recipe only called for ¾ cup of brown sugar, but I think adding some white sugar would probably help. I made this dessert when we had a couple of friends over for dinner, and they both told me that it was great. Rob tried some of it, which I definitely appreciate, since he generally avoids all desserts unless they come in brownie form. (He claims this is the first time he has ever eaten “cobbler,” but I find it hard to believe he’s lived 30 years and never had any of his Grandma B’s widely acclaimed cherry cobbler). But in the end, this dessert was not my favorite. We ate less than half of it and I finally wrapped it up and put it in the freezer, which I think of as Food Purgatory. 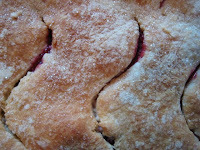 I don’t know if cobbler is something that freezes well, but after going to so much work, I couldn’t simply throw it out. In sum, it was pretty good, but I’ve realized that if I’m going to put that much effort into something, it ought to be chocolate. Moving on. 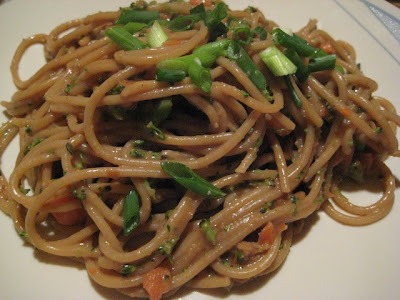 For dinner tonight, I made Peanut-Butter Noodles from the Vegan A Go-Go website. They were A-MAZING!! All I can say is that Vegan A Go-Go rocks! This recipe was so easy to make, and it was seriously one of the best things I’ve ever tasted. I used low-sodium soy sauce and low-sodium vegetable broth for the sauce and it was still pretty salty. I’m not sure what “chili paste” is, but I had some “chili garlic sauce” and used that instead. I also chopped up some carrots and broccoli, steamed them, and added that to the final mix. The whole thing turned out so good that I’ve decided to bring it to one of the Thanksgivings that Rob and I are attending this week (we’re going to several celebrations in multiple states). Thanks for the great recipe, Vegan A Go-Go! Fabulous Peanut Noodles. Showcasing Auntie's old Corell dishes again. I know I just ate it, but seeing it is making me hungry again. too bad there's no left-overs :( you'll have to wait until thanksgiving. I would be a huge fan of this becoming a regular section of your blog.